This Spark sample application is inspired by the Rapid Response Kit, built by Twilio and used all over the world by organizations who need to act quickly in disastrous situations. Aid workers can use the tools in this app to communicate immediately with a large group of volunteers. In situations where all parties need to talk at once the organizer can quickly spin up a conference line. In other situations she can broadcast a spoken message to a list of volunteer phone numbers. Check out how Alphasights, an expert services company, used Twilio to cut their conference calling costs by 80%. To run this sample app yourself, download the code and follow the instructions on GitHub. You might also want to click around the views for this app, since in this tutorial we will only be covering the Twilio pieces. 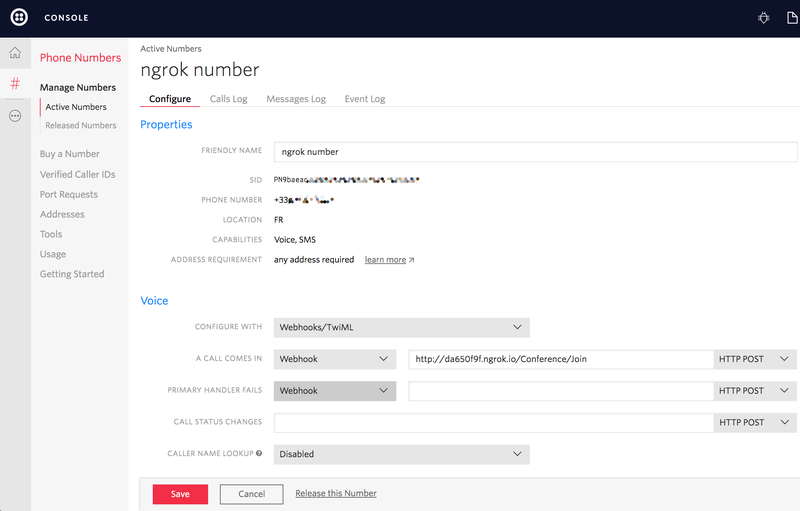 Before we can call our conference line we need to configure one of our Twilio numbers to send our web application an HTTP request when we get an incoming call. Click on one of your numbers and configure the Voice URL to point to our app. In our code the route will be /Conference/Join. Our Twilio number is now configured to send HTTP requests to this controller method on any incoming voice calls. Our app responds with TwiML to tell Twilio how to handle the call. We use the Twilio Java library to generate some TwiML that tells Twilio to Dial into a Conference that we're naming RapidResponseRoom. This means that anyone who calls your Twilio number will automatically join this conference. Next we'll turn this into a moderated conference line, with a moderator and listeners. In this controller we Say a simple message and then ask the caller to choose a role. So our caller have listened to a few role options they can choose from, and next they will choose one. For this we tell Twilio to Gather a button press from the caller's phone so we know which role they want to use. Let's see how next. The <Gather> verb from the previous step included an action parameter that took an absolute or relative URL as a value — in our case, the conference/connect route. When the caller finishes entering digits Twilio makes a POST request to this URL including a Digits parameter with the number our caller chose. We use that parameter to set a couple variables, muted and moderator, which we then use to configure our Dial and Conference TwiML elements. In addition to hosting conference calls, an organizer can use our application to broadcast a voice message to a list of phone numbers. She can do this by choosing a recording from a dropdown, entering a list of phone numbers and clicking 'Submit'. To power this feature, we'll use Twilio's REST API to fetch all of the recordings associated with our account. If our organizer wants to record a new message, we'll call her phone and record her response. Now that we know what this feature is all about, let's take a dig into the code. Before performing any request to the Twilio API using the helper library, you must initialize the client using the static method init() with your credentials on the Twilio class. After this is done, you can make request to the API as much as you like! This route fetches all of the recordings associated with our Twilio account. We could filter these results by date or call sid using Twilio's API, but for this example we just pull all recordings. In order to use Twilio's handy API we need to first create our Twilio client, which we can easily do by passing our credentials. We can fetch all the stored recordings, but how can we record a new message? Let's see that next. If the organizer needs to make a new recording, we simply call her and record the call. Twilio makes this simple with the Record verb. Here we Say something to the caller and then Record her message. There are many more options we can pass to Record, but here we simply tell it to stop recording when '*' is pressed and to redirect to broadcast/hangup, so the call drops when the recording is finished. We just saw how to list all recorded messages and how to record a new one. The last thing left is allowing a caller to broadcast one of those recorded messages. We'll see that next. This controller processes our voice broadcast webform, starting with the phone numbers our organizer provided. Next we initiate a phone call to each number using Twilio's REST API. When Twilio connects this call it will make a request to the Url parameter to get further instructions. We include a recording_url parameter in that URL so that our broadcast.play controller will know which recording to use. That makes the work for our broadcast/play route simple — we just Play the recording. That's it! We've just implemented two major features of a Rapid Response Kit! Maybe in the future you can tackle some of the other features and build a full-fledge kit! That's it! We've just implemented two major features of a Rapid Response Kit! Maybe in the future we can tackle some of the other features and build a full-fledge kit! Instantly collect structured data from your users with a survey conducted over a voice call or SMS text messages. Learn how to create your own survey in Java. Send SMS alerts to a list of system administrators if something goes wrong on your server. Thanks for checking out this tutorial! If you have any feedback to share with us, we'd love to hear it. Tweet @twilio to let us know what you think!